Loyal lobsters Van Diesel and soon-to-be Mrs. Van Diesel decided to send Barack and Michelle Obama a wedding invitation… you know, just in case the Obamas wanted to join them on their special day. 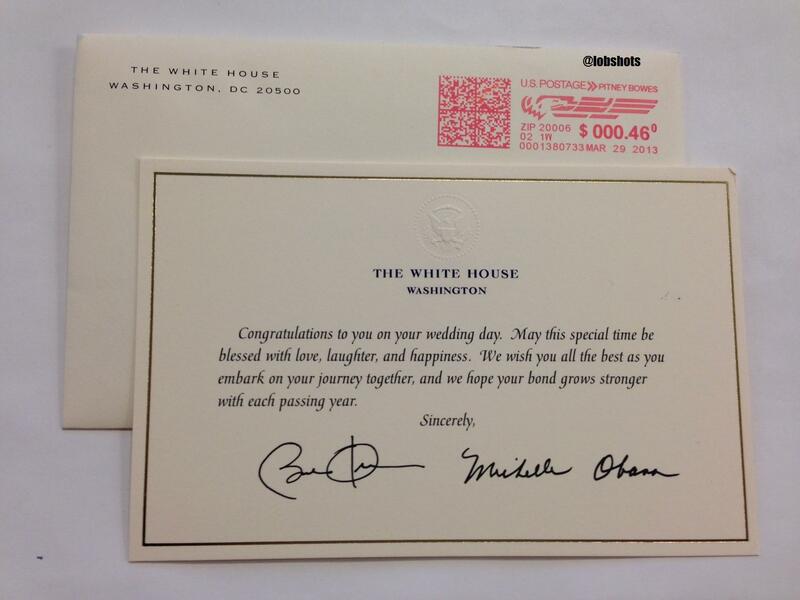 Power move right there… inviting the President and the First Lady to your wedding. The letter you see above is the response they got. Official White House seal and all. Obviously it’s a form letter, as it doesn’t refer to them by name, it’s pretty cool to get any response. Did you notice they never actually decline the invite? For security reasons, they can’t let America know they’ll be there, right? So, 50/50 they just show up unannounced to the wedding. I’ll keep you posted. This entry was posted in Entertainment and tagged Barack and Michelle Obama, Barack and Michelle Obama wedding invitation, Barack Obama, Michelle Obama. Bookmark the permalink.